Rome, GA - The 2019 Rome Braves schedule has been released. Rome will open the season on the road April 4th with a three game series at Kannapolis and three games in Columbia before returning to State Mutual Stadium for the home opener on April 11th against the Greenville Drive. The opening home stand includes three games versus the Drive (Boston Red Sox Affiliate) and three versus Columbia (New York Mets Affiliate). "We are excited to release our 2019 Rome Braves game schedule," says Rome Vice President and General Manager Jim Bishop. "2019 will be our 17th season at State Mutual Stadium and we look forward to building a tremendous promotional calendar around these home dates. Please reserve your season tickets and mini plan package seat locations with us now. 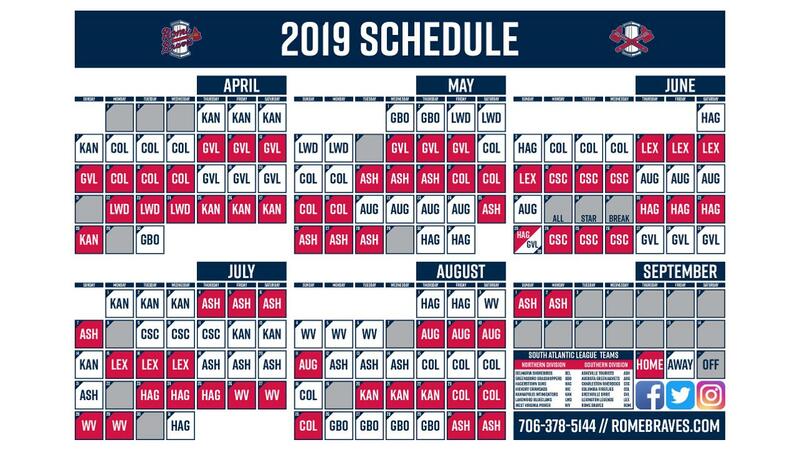 The 2019 season will be a great year for Rome Braves baseball!" The 2019 Promotional Calendar and specific game times will be released in the near future. For season ticket information, special ticket plans, and to book your group, party, or picnic call 706-378-5100.